Recent theories of galaxy-formation and cosmic evolution are inching closer to embracing the radical geometry of general relativity. In the decades since the publication of the Schwarzchild solutions to the Einstein field equations as given in his theory of general relativity, many physicists have staked and made their professional careers on the seemingly abstruse mathematical issues involved at the heart of the debate. 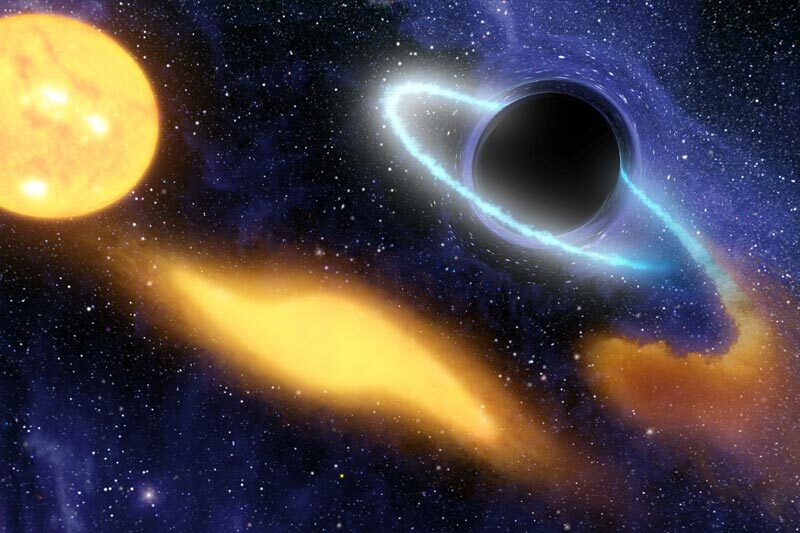 Scholars have been fascinated and even sometimes ‘consumed’ by the study of black holes and the associated conceptual complexities, perhaps especially the novel interpretations of non-linear geometry relating to the prediction of an extreme curvature of space and time. Initially a seemingly bizarre consequence of the field equations, it was perhaps all the more so due to the very unique conditions under which this “affine” torsion, or gravity vortex, ought to occur. Since the days of those first thought-provoking theoretical intuitions, the body of scientific theory regarding black holes has grown enormously. We now believe that black holes are cosmic anchors at the center of most galaxies, curving the geometry of the universe at large, perhaps even “fracturing” it into infinite geodesic ‘slices.’ We are fairly certain that there is an awful lot of something providing an enormous amount of gravitational radiation. We also now have a deeper understanding using differential geometry of the Newtonian assertion that gravity is acceleration. We are even beginning to look for gravitational waves, or ‘graviton’ particles, which amounts to something like looking for an accelerating shift in the geometry of spacetime. Most of us know, but perhaps have not fully recognized the importance of the geometric innovation within Einstein’s thought in shifting from special to general relativity. The explanation of this shift can be summarized as follows: in special relativity, Einstein is still using a more or less linear geometry of curved space, which is called a Minkowski space. With the shift to general relativity, Einstein has gone beyond curved Minkowski spaces to a new kind of ‘self-constructing’ space called a Lorentzian manifold, which possesses a radical non-linear geometry of momenta, whose curvature is defined by stress-energy tensors (or momentum.) Einstein had fully embraced an exotic auto-metric geometry where solutions of the system of equations are potential spatio-temporal geometries. We began by considering black holes to be ‘marginal’ occurrences, but we are beginning towards a theory where they play a central role in the evolution of the cosmos. The lesson of the history of black holes is that autopoesis is an adequate paradigm at any scale, from the quantum to the cosmic to the social. Evolution is what the shift to ‘non-linear’ geometry in general relativity means: not only that spacetime has a curvature, but that this curvature has a curvature, that it can be fast or slow, self-destructing or evolving, divergent or harmonious, unified or fragmented, self-similar or infinitely differential, and arguably, even self-creating. Evolution is a cosmic principle that applies equally to tiny particles as to living creatures and galaxies. But we must always remember that the relevance of evolution is political first. The history of the discovery of black holes reminds us of the importance of seemingly marginal occurrences. In other words, we ought to distinguish more clearly between the event of change and the process of change. Most will agree that the process of change and evolution is always in some sense amenable to observational modelling, because reality as such obeys only an internal and self-created measure, or law of motion. The event of change is, on the other hand, ontologically transversal — a new space embedded within an old space. It may also be helpful to think of this evolutionary ‘event’ as the shift between different spaces, or spaces moving at different speeds relative to one another. After all, even separated spaces can be made to intersect, and we can immerse a space within another space. So this is the cosmic situation: all spaces are interconnected, but all relationships are in flux. Knowledge, like life, is a rhizome, spreading out in all directions at once, ever-shifting, evolving and involving, gradually or quickly adapting to always-changing conditions. The question of knowledge is always which situation it is deployed into, the transversal path it travels between spaces, or into an outer space from an inner space. What is important to recognize is that this fractal shift is nothing transcendental: it is a purely mathematical function. Consider a mapping f from a space A to a space B immersed within it. What is it that we should take the ‘->’ to represent? The ‘->’ stands for an energy-transformation method, or transversal operation. In other words, ‘->’ is any pairwise-matching rule that establishes a ‘rhythm’ between inter-facing geometries. We can understand this transformation in terms of Nash’s work on immersion. Simply consider that for a given element x of an inner space, we are guaranteed some information-preserving mapping onto the outer space (into which the subspace is immersed)– regardless of the global topogical structure or local geometrical structure of either of the spaces. In the pa, we begin with the void. It is an undistinguished space; we could argue there is no Universe because there has been no distinction made. Since all distinctions are made by an observer, the Universe is still a void while there is no observer present. Not a vacuum but vacuous: those things which may exist have not yet been told they may exist. Upon this void, let us suppose an observer arrives. Now we have a distinction: there are two spaces and thus a Universe, that is, we have made a mark, crossed a limit, traversed an interface via a singular point of local geometrical tension, which thereby accounts for the construction and subsequent immersion-into-itself of a complex topological space. We shall call such a separable or self-immersible space an observer space. Note the recursivity of this definition, for we are not concerned here with a projective geometry (though it is simple enough to derive it from the primary arithmetic) or even the seemingly critical question of vision; what we are rather interested in is the ‘original’ nomad transversal operator–the work of the observer— which illuminates the heart of cognition, with the fact that the whole of mathematics (set theory, logic, arithmetic) can be derived from the primary arithmetic merely being the most clear example. Observation is the primary transversal operation. Tranversal operators thus allow us to describe the evolving ex-tension of space from the involving in-tension of observation, from the functionalizing of the enunciatory-apparatus, or assemblage of presignifying intensities. Such an operator is a worker, and as such circumscribes and resonantes with the tension, or differential movement, between two spaces’ rules of measuring force. We could write: A(x) -> B(x), the particle x being the object-flow or subject-group. This can also be read as presenting the differential momenta between two non-linear dynamic systems. We can further decode this as a mapping which embeds or immerses an open space within itself, as in the conventional notation f(A)=B which often gets shortened even further A(B). But the real question is this: where does the difference originate? Where did the tension come from in the first place? Not of course the tension within each space which forces every movement onto an observable path — but rather the tension ‘between’ spaces observed in the transveral (function generating) operator ->. The transformation-operation encodes a transversal action across any spaces. Thus it describes the molecular evolution of a subject group, and not the position of a null transcendent absolute point of view, but precisely that of an engaged self-observing agency acting within time to fragment, tear apart, and finally dissociate a space entirely — what eventually gets called ‘working’ — in order to transform it into another.